Call 904-494-8236 to schedule your first appointment. You may have noticed a loss in hearing ability as you’ve aged, and finding a dependable, professional hearing aid center may be important to maintaining your lifestyle. Serving the entire Jacksonville area, Miracle-Ear® has hearing care specialists with the latest technologies that will improve your sound perception and enhance your hearing. The technology for our hearing aids was invented to improve the quality of the sounds that people hear. Our GENIUS™ Technology will especially assist with hearing and understanding the sound of the human voice even in social situations with distracting background noises. Our hearing solutions are also designed and constructed with discretion in mind. Many will fit into your ear in such a way that even close friends will not be aware that you're wearing a hearing aid. Many aids also have remote adjustment capabilities, allowing you to fine-tune your hearing aid without anyone else being aware. When you’re shopping for hearing aids in Jacksonville, FL, get to know the experts at the Miracle-Ear locations. Discover and experience the Miracle-Ear advantage. With over 1,300 locations nationwide, we’re the brand America has learned to trust. If you like to travel away from the local area, each of our center has trained hearing care specialists who are available to assist you with your hearing and hearing aid. The Jacksonville, FL Miracle-Ear is a proud provider and sponsor of the Miracle-Ear Foundation. With every hearing aid sold we help provide the Gift of Sound to low-income, qualified candidates who have exhausted all resources to provide for their hearing health. See how we help those living in our communities! Jennifer Keyes is your local Licensed Hearing Aid Professional at Jacksonville, FL. 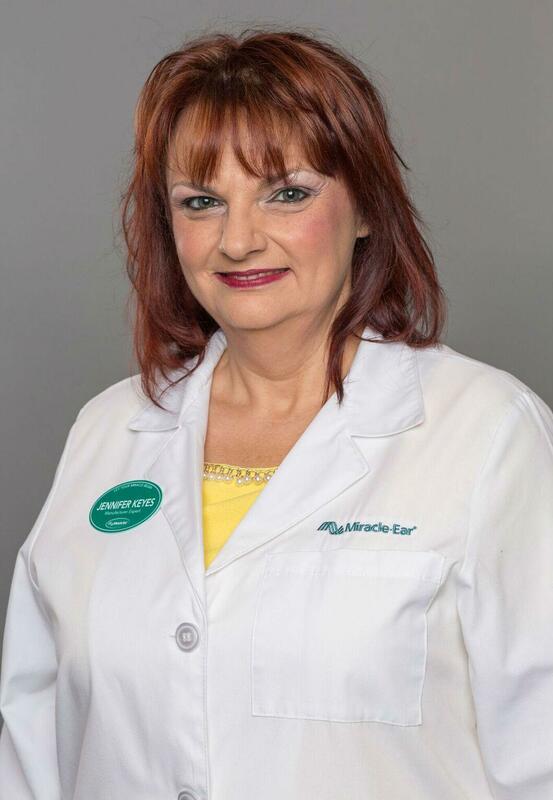 Jennifer is Board Certified in Hearing Instrument Sciences and has been licensed as a Hearing Aid Specialist by the Florida Licensing Board within the Florida Department of Health. In addition, Jennifer has been through extensive training with Miracle-Ear and has received her Miracle-Ear Professional Certification. Jennifer has also been trained in Live Speech Mapping, Real Ear Measurement and is proficient with all Audiometric equipment to service your needs. She has been with Miracle-Ear since 2011. In addition, Tracy Burns is the Office Manager for Miracle-Ear in Jacksonville. Tracy is fully trained and completely certified by Miracle-Ear as a Professional Assistant. Tracy has many years experience in patient relations in several medical fields. Jennifer and Tracy both come to us from their home state of Indiana where they became friends at 12 years old. They each raised their children and decided to relocate to sunny Florida. Working as a team, Jennifer and Tracy are here to service all of your hearing needs at Miracle-Ear on Atlantic Blvd in Jacksonville.